So about a month ago Stacey from Goodwill Huntingg sent me this awesome vintage skirt! 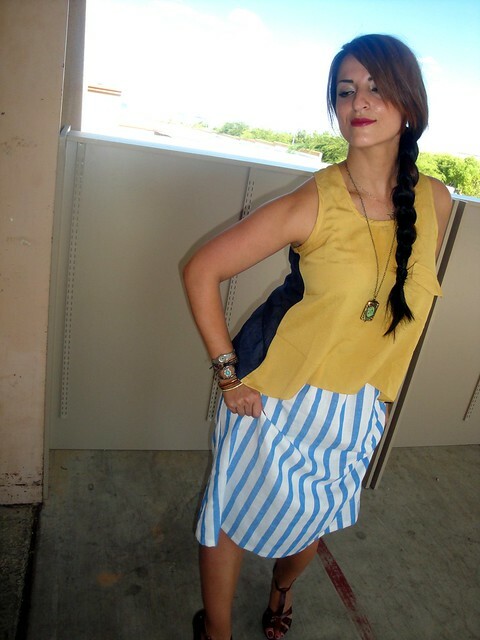 Every week she features a new blogger styling one of her pieces she has already styled herself. She then asks all of her readers....WHO WORE IT BEST? I'm pretty sensitive so I may not look at the number of votes haha but I must say I had so much fun with it! I had just recently won a gift card to Ruche and I got this top and the locket...I LOVE this store...I just recently discovered it...you should too..
You know what the best part is? I get to be a part of Stacey's creative goodness...AND I get to keep the skirt...which I love...sooooo click right HERE and vote for who you think wore it best...and check out her bloggy...leave her some comment love...she is a kindred spirit and one of these days we will meet and thrift the heck out of VEGAS! I didn't notice the pit. lol. You look fabulous! You look fabulous in this outfit! LOVE the skirt & wearing give-a-way wins! Loving that skirt and the colors!! !